I think there is a saying “Rarer than a hen’s teeth” and it is a good thing hens teeth are rare. Hens are very protective of their eggs and chicks so even though being pecked by a chicken is not fun it is much better than being bitten. 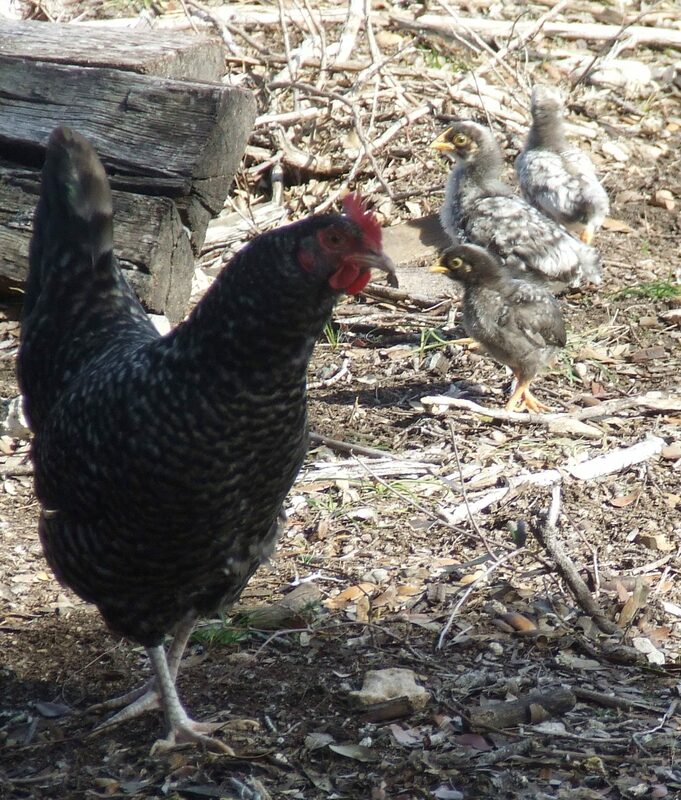 This spring I decided I was not going to raise any chicks as the survival rate on my farm is pretty low. 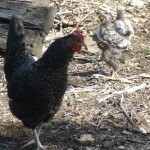 I have 2 hens, aptly named Squawker and Screecher, who fight over the chicks when they are just hatching. This tends not to work out well for the chicks. Then there are the cats who don’t understand the difference between munching wild birds and chicks. You also have to consider snakes and hawks. Despite my plans I am raising chicks. A friend told me they were not being successful with hatching eggs in an incubator. Since I had a hen who was determined to sit on eggs I offered her services up as a surrogate mother. We put 12 eggs under her and all but 2 survived when Squawker chased this hen off the nest and claimed the eggs. Of the remaining 10 eggs 8 hatched and Squawker was so proud. Six chicks were picked up by my friend and we let Squawker keep 2. She was a very protective mother and while putting food and water in for the new chicks I incurred a significant amount of pecking. I am used to this abuse from my chickens but I felt bad for my friend, Stephanie, who was visiting and caring for the animals while I audited the Buck Brannaman clinic. I called to check in and Stephanie reported the 5 day old chicks were venturing out of the nest but not making it back up the ladder for the night. Some hens nest on the ground with their young chicks but not Squawker. With her it is definitely survival of the fittest. So in the process of helping get the chicks back up in the nest, Stephanie was having to fend off Squawker attacks both as she attempted to pick the chicks up off the ground and when she put them in the nest. I suggested she grab my hard hat from the trailer but she felt she was enough of a chicken wrangler to handle Squawker’s attacks. Stephanie is a true friend. I received a distress call from Stephanie on Sat. night and it seemed Screecher had gotten into Squawker’s nest and the ensuing battle resulted in mortal injury to one of the chicks. No doubt that both of these chickens have a Wood temperament. Squawker’s remaining chick is now able to get up in the nest without help but Stephanie had to help me with one further chicken wrangle during her visit. Screecher decided to sit on eggs out in the barnyard as opposed to the coop. This is a death sentence for chickens as varmints are on the prowl after dark. It took me a few days to locate the nest but once I did my plan was to wait until after dark to relocate Screecher and her eggs to the hen house. This plan was working perfectly until my cat, Patches, decided to jump on Screecher just as I was lifting her off the nest. Screecher lived up to her name, got away from me and took off into the horse pasture. This entry was posted in Other Stuff on March 31, 2011 by Madalyn Ward, DVM. In June all occupied nests are surveyed a second time by airplane to document how many chicks were produced. Most of the chicks observed at this age will survive to fledge later in the summer. ……At first Sue thought I was crazy – but she ……has come around……WE ……ARE NOT A COMMERCIAL ENTERPRISE……We no longer sell or trade fertile eggs chicks ……pullets and cockerels…… ….Babe was an excellent brooder a devoted mother and ….raised several chicks.